NOTICE IS HEREBY GIVEN that the Southern Sierra Integrated Regional Water Management Group (Group) will prepare an update to its adopted 2014 Integrated Regional Water Management Plan (IRWMP). This update is prepared in accordance with the updated State of California Department of Water Resources IRWMP Guidelines. The IRWMP will include groundwater, surface water, and other water management goals, objectives and identify strategies and projects to implement the IRWMP in a consensus-seeking basis model. The Regional Water Management Group formed as a group of agencies, non-profits and landowners and other interested stakeholders. Stakeholders who wish to provide input to the IRWMP may do so by submitting a written letter to Bobby Kamansky, Regional Water Management Group Coordinator, Sequoia Riverlands Trust, 428 S. Garden Street, Visalia, California 93277. Quarterly meetings will be held in June, September to review updated chapters. "With the impacts of drought gripping California for the third year, information about water is more important than ever. In 2009, the RWMG identified a critical need for better information about groundwater in the southern Sierra. We worked with consultants to determine the scope of work and the cost for water supply studies in at least five southern Sierra communities, and in 2012, I wrote a water supply study prospectus based on discussions with DWR and input from the region's stakeholders. The study seeks to understand the "water budget", or quantity and quality of the water in the Kaweah Watershed as it flows from the Great Western Divide and nine smaller watersheds into the underground aquifer. The study examines several aspects of the area: local geography, geology, land use, precipitation, hydrographs and water demand." "In this year, when drought impacts grip the majority of California, identifying solutions to our water challenges is more imperative than ever. The water challenges we face affect us on many levels, from the water that comes out of our tap, to the water that irrigates the food we eat, and that which filters back into the ground to restore underground aquifers. Managing this important resource is complicated and is marked by a contentious history. 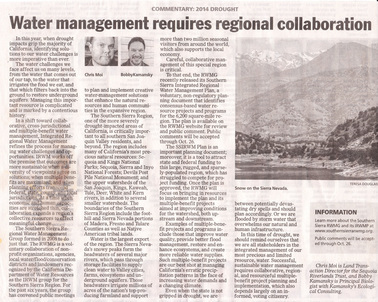 ​Press release, September 23, 2014: Announcing the RWMG's release of the complete draft Southern Sierra Integrated Regional Water Management Plan and request for public comments. Press release, May 22, 2014: Announcing Southern Sierra RWMG's Climate Change Workshop on June 5, 1-5 pm at Provost and Pritchard in Fresno, CA. SSRWMG Notice of Intent: Formal notice of intent given by the Southern Sierra Integrated Regional Water Management Group (Group) to prepare an Integrated Regional Water Management Plan (IRWMP). Posted in the Fresno Bee.